Now that I have Bluefin up and running and things are stabilized, I wanted to give you a few tutorials on some of the common tasks I perform daily. 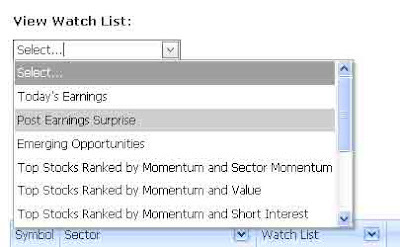 To find stocks with a significant Earnings Surprise in the past quarter, Select “Post Earnings Surprise” from the View Watch List drop down menu. Next, in the “6MthHi” column, enter the value: 20. Then click the icon next to the value that looks like a key. This will bring up a list of conditions that you can apply to the value. Clck “Is less than or equal to” and the list will filter out all stocks outside of the range. Finally, you can click the column header “VSrg” to sort by volume and see which stocks are getting attention today. All data can be exported to excel by clicking the Excel icon found next to the title. No Response to "How To: Find Stocks with an Earnings Suprise within 20% Six Month High"